That got me thinking about what hangs above my desk. So, of interest to possibly no-one but me, here is the annotated version of my current office pinboard. (An unmarked image is here.) Yes, there are lots of penguins! I’m a fervent follower of David Allen’s ‘Getting Things Done’ principles. This flowchart is a reminder of how to deal with the never-ending stream of stuff that comes ‘in’. A visual reminder (artist now unknown) of the SUCCESs Model from the Chip and Dan Heath’s ‘Made to Stick’ — if we want an idea to be ‘sticky’, there are six principles worth trying to incorporate: Simple, Unexpected, Concrete, Credible, Emotion, Story. These are front-of-mind when I prepare any talk (from keynote talks to weekly classes). When I think about the inspiring ShadowCon and Ignite talks from NCTM, they have most or all of these elements. Most (all?) work starts at the left of this diagram — messy and uncertain — and ends at the right with clarify and focus. A reminder that it’s natural to start in the messy phase. A ‘parchment’ delivered by three of my students a few years ago, advising me (as requested) of their group members for a project. It was originally sealed with wax and a ribbon. The fact that they went to the effort to follow through on an in-joke we had reminds me about forming strong, close relationships with each student. 3D bridge designs by high-school students from workshops that we run. Students use coordinate geometry to plan their bridge and prepare the data file. We turn it into G-code and print the bridges. They then compete as to which bridge can hold the most weight. Reminds me about how creative students can be if we give them a chance. Writing advice from Hugh Kearns and Maria Gardiner from Thinkwell. Includes ‘nail your feet to the floor’. A regal invitation to dinner last year with The Duke of Kent, the Governor of South Australia, and fourteen other ‘young emerging scientists’. Probably the only time I will need to research how to greet a member of the Royal Family. LaTeX commands for making citations. I can never remember these. This PhD Comic about writing. It’s exactly my approach to book writing. Don’t tell my editor. A BART ticket reminding me of NCTM 2016 in fabulous San Francisco. A thoughtful gift from a student thanking me for supporting her through a challenging semester. An enlarged copy of the geocaching stickers I made for our Japan Jaunt in 2014. Apparently this is how my partner imagines me lecturing, or otherwise addressing a crowd. Huh. 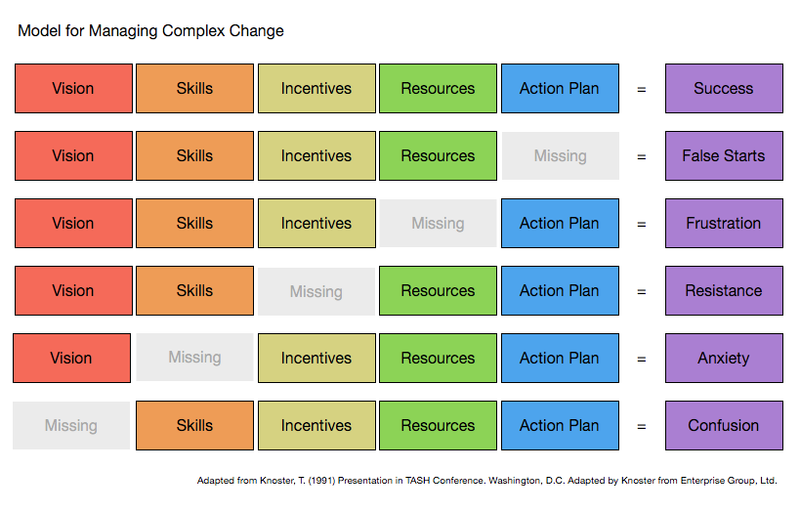 The Knoster Model for managing complex change. When I feel overwhelmed, frustrated, confused, anxious or otherwise unhappy with how a project is going, I review this chart. I don’t use it to be prescriptive, but it helps me reflect on what dimension might be missing from a successful project. More advice from Hugh Kearns and Maria Gardiner, this time for overcoming the inertia of starting a task. It is so faded that you can’t read it, but it says two things. The first is ‘Park on a hill’, which means to leave off at an easy point to pick back up from. The second is ‘Action -> Motivation -> Action (-> Reward)’. It is common to think that you should wait for motivation before starting, but oftentimes it is action that leads to motivation. Spend 5-15 minutes on a task you don’t want to do; if you aren’t motivated, you are free to stop. If you are motivated, keep going! Fractal stamps from when I visited Macau in 2006. Nametags from most (but not all!) of the conferences I’ve been to since January 2015. Can you spot NCTM 2016? A beautiful Hiroshige woodblock calendar. I’ve been to Japan four times in two years. I find woodblock museums to be incredibly peaceful places. Right above my monitor is where I put the little pieces of paper with big advice (and with room codes, phone numbers, grammar reminders and the like). I have a problem with saying yes and with being helpful. I don’t follow my own advice nearly enough. Finally, just to round it out, here is the pinboard outside of my office. It is a rotating collection of funny and pointed cartoons. The intention is to encourage students and colleagues to stop and chat — but only if my door is open. What does your pinboard look like? What are your motivating images? I’d love to know!